It has been over ten years since my first love affair with web design. The first few years of that decade was spent enthusiastically designing different layouts for personal websites and blogs I maintained all over the internet. However, the last half saw very little creative juices output on my my part, not necessarily due to the lack of spark plug juices (although, I did seem to run out of ideas for a while), but more of the fact that I had become more active in my offline life. I enjoy spending more time in “the real world” but every once in a while, I do miss sitting in front of the monitor wracking my brain for hours until I came up with layouts to suit my liking. 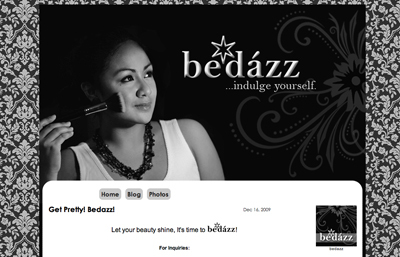 Since my sister was planning to launch a Multiply site for her very own set of makeup brushes, Bedazz, I took the opportunity and volunteered to help her design the whole site from start to finish. I quickly staged a late-night photo shoot, with my sister as the model. Our very own living room was turned into a makeshift studio, with one of our table lamps used as soft lighting. My sister posing with one of her brushes. We then had a quick product shoot the following afternoon in our garage, using the sun’s natural light. And with all the graphics and images ready, I spent several hours designing and fiddling with template codes. A simple Black and White layout with just a few embellishments here and there. 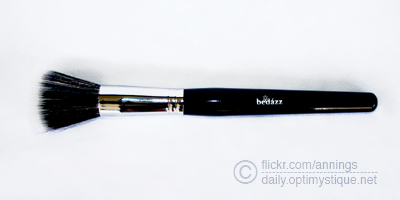 Bedazz currently has three makeup brushes in its line, with several others in the testing stage. I’m not being biased, but the brushes are really nice! 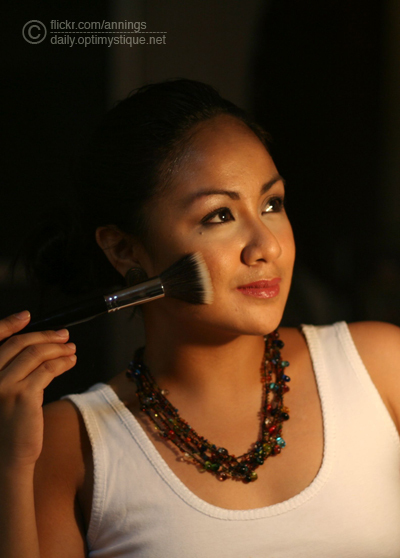 Mix good quality with affordable prices (only Php700 or around USD14 for a full-sized stippling brush! ), it sure is a great deal!